Dry eyes syndrome is the most common problem in India with a prevalence of 32% and it is higher than the global prevalence. As a pioneering step, first, of its kind, Kasturba Gandhi Nursing College, a constituent college of Sri Balaji Vidyapeeth, Deemed to be University has launched a special medical device for the treatment of Dry Eyes Syndrome. On the basis of the concept of ‘Make in India”, SBV has developed this “Duo Sense Optic care Wear” at an affordable cost and made a remarkable mark in the healthcare system. This device is unique in its nature, that both the hot application and the cold application can be given by the same device to make the eyes comfortable. For the society to benefit the maximum from this notable invention, an unprecedented technology transfer between an Academic Institute and a Healthcare company happened in SBV. 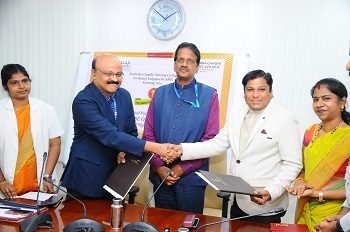 In this regard, a Memorandum of Understanding was signed between SBV-MIPTECH (Mission for Intellectual Property and Technology Transfer)and MEDIZONES on 10th April 2019. Prof.Subhash Chandra Parija, Vice-Chancellor of Sri Balaji Vidyapeeth graced this momentous occasion and addressed with overwhelming happiness that SBV will continue such marvelous efforts in the upcoming years and enhance their significant contribution towards the healthcare system. He congratulated the inventors of the device Mrs.Manopriya V and Dr.Renuka K, Principal of Kasturba Gandhi Nursing College for their exceptional contribution to the university as well as the nation. Prof. A.R Srinivasan, Registrar of SBV, Dr. Adithan C, Dean Research, Dr. N Ananthakrishnan- Dean of Faculty, Dr. M Ravishankar– Dean and Dr.NirmalCoumare V MedicalSuperintendent of MGMCRI were also present at the signing ceremony.